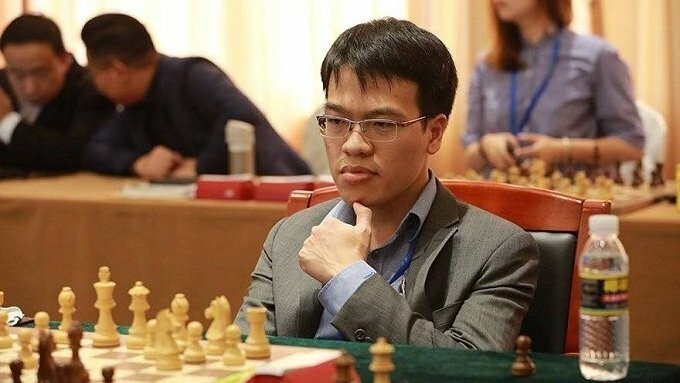 Two Vietnamese representatives, Le Quang Liem and Nguyen Anh Khoi, have won their first two matches of the ongoing 2019 Sharjah Masters international chess tournament in the United Arab Emirates to join 28 other contenders in the leading group with two points. Quang Liem (Elo 2715) is named the no. 3 seed in the competition, behind top seed Wang Hao of China (Elo 2718) and second seed Vladimir Fedoseev of Russia (Elo 2715). In the first round on March 22, the Vietnamese chess ace faced an easy challenge, Rayes Abdul Kader (Elo 2219), and needed just 28 moves to finish off the Syrian opponent. The second game on Saturday saw Quang Liem maintain his stable form as he comfortably overcame the Indian representative, Shyaamnikhil P (Elo 2429), after 50 moves to extend his winning streak. Vietnam’s young talent Nguyen Anh Khoi followed his senior compatriot to record two consecutive victories over Ali Abdulaziz (UAE, Elo 1988) within 34 moves and Kaabi Mejdi (Tunisia, Elo 2275) within 29 moves. Meanwhile, Quang Liem’s two biggest title contenders, Wang Hao and Vladimir Fedoseev, had to share the points with lower-rated players in the second round. In the third round today, Quang Liem will play white against India’s Venkatesh M.R. (Elo 2517), while Anh Khoi faces a tough challenge, 15th seed Ukrainian Alexander Zubov (Elo 2605). Sharjah Masters 2019 is taking place from March 22 to 30 with the participation of 150 chess players from 30 countries and territories, playing according to the nine-round Swiss system. The tournament features 33 grandmasters, including 14 with an Elo rating of 2600+ and three players rated above 2700. A prize fund of US$60,000 is up for grabs, with the champion receiving US$15,000.